It felt much like a kick in my abdomen. My spirit grieved. Not long after the negative emotions spiked, signalling to me that it was time to put up my protective shield. I could no longer contain my emotions, which by that time was raw and very deep, that needed some quick first aid attention. So I rushed through the door and quickly paced myself down the hallway into the nearest bathroom. What a difference life makes in a very short space of time. My week began with exceeding great joy, high hopes and expectations. Perhaps in part to the fact that, the grass has been looking greener and I found myself navigating in that direction with much laughter in my spirit. I've had moments where my imagination brought me to the peak of the mountain and a glimpse into glorious ecstasy - my dream was finally coming true. My new blog series on 'Relationship Enrichment, Marriage Rescue' which got off to a great start here earlier this month, has been going quite well. In addition to that, I focused much on the goals I had set for myself recently of getting back to my ideal body weight. I had procrastinated far too long - now I am having fun with my exercises and is looking forward to the new me. But what exactly made the end of this past week so unwanted that it had me looking for an escape route? I had succumbed to what is called the 'sic-a-folk syndrome.' I am certain you too can relate to that, so it is quite okay, without me going into definition and detail, that you can put your own spin on it. I swallowed the anger, frustration and the feelings of inadequacy that the actions of others had bulldozed my way. The shipping company 'screwed up' again. Not only that, the transport systems malfunctioned, with no obvious strategy or contingency plans for the free movement of people and freight cargo. In another area, I had a first hand look at the loss. Without having the actual numbers to hand, my immediate impression was, the $ value would be high. A sad loss of much needed resources. I kept on crying out aloud "Oh Lord Jesus," and "Lord give me strength." It became very obvious. One person close to me said, "You calling on the Lord a lot today Ms. Wilson," to which I replied, "Yes, because only He can help right now." Later on in the afternoon, another said to me, "Have I told you lately that God is good?" I laughed and then I responded, 'All the time God is good. Because it is only He that could have restrained me all day, and kept me so that I do not explode." His face lit the room and with a much wider grin on his face, he said again, "Have I told you lately that God is good?" My response was the same, "All the time, God is good." Disaster was all around me. For hours, flesh punched my spirit with one weakening blow after another, but the more it did, I kept on looking to the God in me. I cried more in my secret place yes, yet I continued to refuse the enemies plans to dwell on the present light affliction and for me to cascade into a tirade of shouts and resentment towards those I felt had bereaved me of my joy and happiness. My moment of empowerment came at 1:10 am this morning, because in hind sight God showed me how He covered me. He covered the mess and embarrassment by holding back the plot of the enemy that would have brought even more disaster, and endangerment to the lives of many others. It's not me, not my deeds, nor my actions, not even how I worship, pray and trust Him, but His grace and mercy that has made Him show favor towards me and to the others. 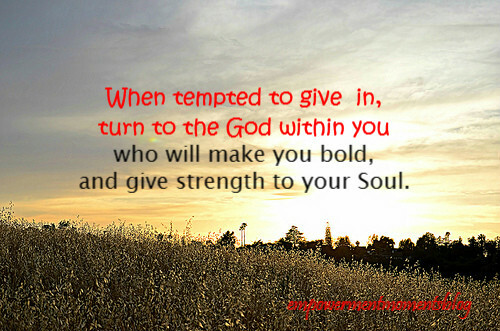 My encouragement to you today is this: When tempted to give in, turn to the God within you who will make you bold and give strength to your soul. He will make you feel like you are on top of the world, when deep within you feel so inadequate and insecure.It's the God in us that makes our lives so blissful and peaceful, when chaos is all around. It's the God in us that takes our mess and turn it into a message of hope and courage! When trouble comes, turn to the God in you who will give you a smile when it really should be a frown. When the weight of this world is upon your shoulders and trying to push you to the ground, look to the God in you who will lift your heavy load and be your burden bearer. When times get rough and the sea billows roar, turn to the God in you who will give you beauty for ashes, a garment of praise for the spirit of heaviness and the oil of joy for your sadness and despair. The light affliction is for a moment and is subject to change by the power of the words that you speak. Today, I am eternally grateful to God who has brought me through and has given me all the reasons to smile, to love, to laugh and to go on living the abundant life that He promised me through Jesus Christ His Son. God bless you and thank you for being a part of Empowerment Moments Blog. If this article blessed and inspired you, then share it with others so that they too will enjoy the same blessing in their life. Like my page on facebook here and receive more great inspiration. Yvonne--this post rings very true to me. There are some days when I look around and it feels like it's all falling apart, but the one thing that keeps me going is knowing that God is good, al the time. Only he has the final plan of my day, so I keep my trust in Him. Hi KallyC, there may be pain in the moment of the affliction, but they are growing pains - we grow spiritually, we are stronger because times like these do push us closer to God. He never gives us more than we can bear - He is greater in us than anything else around us that we face. Continue to be encouraged. Blessings for a great week ahead!